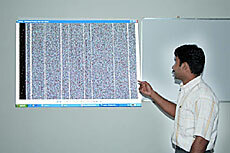 An Indian engineering student has developed a data storage technology called “Rainbow Technology”. The best feature of this technology is the data is stored in ordinary paper using geometric shapes instead of digital format. Using this technique around 450GB (a modern Blu-ray disc can hold max of 50GB) of data can be stored on a single A4 sheet paper. To retrieve your data is all you need is a scanner and some specialized software which can analyze and decode your data. A paper with fully loaded data will actually look like a random modern art painting. We actually need this kind of innovation at this point of time when we are in need of large data storage media. Things I would like to know more about this technology? The reliability of data on the paper or plastic paper against day to day use.